Any bank-attached bar form that is induced by a flow obstruction (e.g. bedrock outcrop, boulders, large wood, vegetation). The resultant bar form often has a downstream fining sedimentary sequence. Perturbations in flow and subsequent deposition are induced by obstructions. 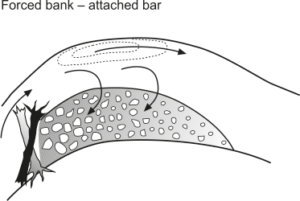 The resultant bar morphology is shaped by the flow obstruction, which promotes turbulence and deposition in the wake of the obstruction in secondary flow structures. Depending on flow stage, these secondary flow structures may induce local scour around the obstruction.